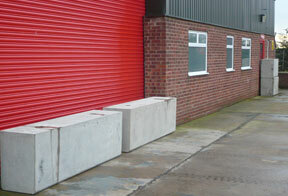 Concrete barriers from Polysafe are a simple and cost-effective solution to the problem of ramraiding. 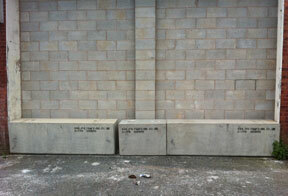 If it is a permanent solution you need, we can place heavy weight blocks in the right place to stop access or if you need frequent access to your doors and need a barrier overnight and weekends only, we can supply a concrete barrier which can be moved with a forklift. Many of our customers simply reverse their forklift in at night leaving 1 or 2 of our 2 tonne concrete barriers across their entrance before closing their doors. And if you need something that looks better than a standard concrete barrier, why not consider one of our concrete planters?